Background Medicines optimisation is a key role for hospital pharmacists, but with ever-increasing demands on services, there is a need to increase efficiency while maintaining patient safety. Objective To develop a prediction tool, the Medicines Optimisation Assessment Tool (MOAT), to target patients most in need of pharmacists’ input in hospital. Methods Patients from adult medical wards at two UK hospitals were prospectively included into this cohort study. Data on medication-related problems (MRPs) were collected by pharmacists at the study sites as part of their routine daily clinical assessments. Data on potential risk factors, such as number of comorbidities and use of ‘high-risk’ medicines, were collected retrospectively. Multivariable logistic regression modelling was used to determine the relationship between risk factors and the study outcome: preventable MRPs that were at least moderate in severity. The model was internally validated and a simplified electronic scoring system developed. Results Among 1503 eligible admissions, 610 (40.6%) experienced the study outcome. Eighteen risk factors were preselected for MOAT development, with 11 variables retained in the final model. The MOAT demonstrated fair predictive performance (concordance index 0.66) and good calibration. Two clinically relevant decision thresholds (ie, the minimum predicted risk probabilities to justify pharmacists’ input) were selected, with sensitivities of 90% and 66% (specificity 30% and 61%); these equate to positive predictive values of 47% and 54%, respectively. Decision curve analysis suggests that the MOAT has potential value in clinical practice in guiding decision-making. 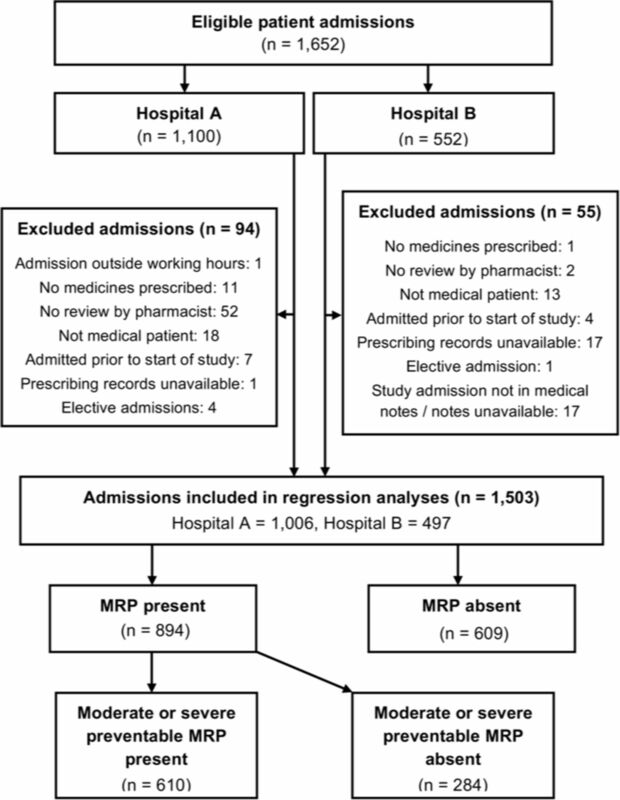 Conclusion The MOAT has potential to predict those patients most at risk of moderate or severe preventable MRPs, experienced by 41% of admissions. External validation is now required to establish predictive accuracy in a new group of patients. This study therefore aimed to develop a methodologically sound prognostic model,28–31 the Medicines Optimisation Assessment Tool (MOAT), to identify hospital patients most in need of pharmacists’ input based on their risk of moderate or severe preventable medication-related problems (MRPs). Our objectives were to develop a decision aid for use in clinical practice to allocate patients to risk groups and to assess its predictive performance and clinical usefulness. The MOAT was developed using a prospective cohort study involving adults admitted to the medical wards of two hospitals in South East England, described in detail in a published protocol.32 Eligible patients were consecutively included at Hospital A from 28 April 2016 to 31 May 2016 and Hospital B from 19 October 2016 to 1 November 2016. As previously described,32 patients admitted for investigation only (ie, elective admissions), and those not prescribed medication during the admission, were excluded on the basis that they did not represent the target population for the MOAT. Patients were also excluded if their prescribing records were not reviewed by a clinical pharmacist during their admission, as it was not possible to ascertain whether they experienced an MRP. In addition to these previously published exclusion criteria, patients were also excluded if their prescribing records and/or medical notes were unavailable; this was to ensure completeness of medicine-related predictor data. MRP data were collected for all study patients from admission to discharge from hospital or the date the study closed (2 weeks after inclusion of the final patient), whichever occurred sooner. renal function was estimated using the modified Modification of Diet in Renal Disease equation rather than the Cockcroft-Gault equation.36 This was due to limited availability of patient weight data. Data entry checks for the accuracy of candidate predictor data were performed on a randomly selected 10% sample of patients. Sixteen data items were checked for each of these patients, and accuracy calculated as the percentage of data items recorded correctly. We also developed and used a ‘MRP identification assessment exercise’ to quantify potential variability in MRP identification between pharmacists at the study sites. This involved the use of four fictitious medication charts each including three or four MRPs. Each MRP was considered to have a binary outcome in terms of whether or not it was identified by each pharmacist. The percentage agreement between pharmacists was calculated and Randolph’s kappa used to assess chance-adjusted agreement (online supplementary appendix S1). The sample size was dictated by practical considerations, permitting inclusion of 1500 patients plus 10% to allow for patient exclusions.32 Adequacy was assessed using the ‘events per variable’ (EPV)37 and precision methods, based on a conservative estimate for the outcome prevalence of 32%, obtained following pilot work with 200 patients. This gave an anticipated EPV of 13, exceeding the ‘rule of thumb’ of 10 or more EPV,37 and the ability to estimate the MOAT’s sensitivity with 95% CI of ±3%, which we considered an acceptable level of precision in terms of clinical usefulness. Internal validation involved the use of 200 bootstrap samples (online supplementary appendix S1).38 42 45 This involved drawing random samples from the developmental dataset and constructing a model, similar to the original regression model, in each random sample. Each bootstrap model was then applied to the original developmental dataset, and optimism calculated as the average difference in performance, in terms of the concordance index (c-index) and calibration slope, between the bootstrap and developmental datasets. Bootstrap validation suggested slight overfitting, the model was therefore adjusted for optimism by multiplying each of the model’s regression coefficients by a ‘linear shrinkage factor’; the adjusted model was then used to create an electronic scoring system. Our original proposal was to develop a simplified scoring system by converting the regression coefficients from the final prognostic model into scores,46 but an electronic system permitted use of the full regression equation, so preventing loss of predictive accuracy, simplifying use and reducing the risk of calculation errors. It also permitted incorporation of usage instructions. While prognostic models provide estimates of the probability that an individual patient will experience an outcome event, this does not provide guidance on an appropriate course of action. ‘Risk groups’ are therefore often created, which indicate a specific course of action, creating a ‘decision aid’ or ‘clinical decision rule’.38 We created three risk groups, categorising patients as low, medium or high risk. The choice of decision thresholds, which are the cut-offs for predicted risk probabilities to justify an intervention (in this case, pharmacists’ input), was guided by a survey of healthcare professionals and patient/public representatives, and consensus views of practising pharmacy staff. This is described further in online supplementary appendix S1. As concern exists over the arbitrary nature of categorisation, with all patients within a group being assumed to have the same risk,42 we chose to report both the risk group and individual predicted risk probability for each patient assessed using the MOAT. This was to guide general prioritisation decisions (by categorising patients as high, medium or low-risk) and also to permit some degree of prioritisation within each category if required. Adoption of a prediction tool into clinical practice requires clinical credibility,50 which is based on factors such as content validity, ease of use, acceptability of the time taken to use the tool and acceptability of the false negative rate.51 52 To investigate these we used: (1) a consensus method to harness the insights of pharmacy professionals regarding the perceived clinical credibility and usability of the MOAT; (2) an assessment of the workload implications and (3) an assessment of the clinical implications of false negative predictions (described in online supplementary appendix S1). Results are reported according to the Transparent Reporting of a multivariable prediction model for Individual Prognosis Or Diagnosis (TRIPOD) reporting guidelines for prognostic model studies,30 and Strengthening the Reporting of Observational Studies in Epidemiology reporting guidelines for observational studies.53 All analyses were conducted using Stata V.14.2. In total, 1652 patient admissions were included in the study: 1100 from Hospital A and 552 from Hospital B (figure 1). Of these admissions, 149 (9%) were excluded: 114 did not meet the eligibility criteria, and prescribing records and/or medical records were unavailable for 35. Online supplementary appendix S2 provides further information of this and other online supplementary results. Of the remaining 1503 admissions, 1378 (92%) were followed up until discharge from hospital: 933 (93%) of 1006 at Hospital A and 445 (90%) of 497 at Hospital B. The remaining 125 admissions were followed until the study end date (2 weeks after inclusion of the final patient at each site). Fifty-seven patients entered the study twice: 46 at Hospital A and 11 at Hospital B. One further patient at Hospital B entered the study three times. The total number of unique patients included in the study was therefore 1444 (960 at Hospital A and 484 at Hospital B). Of the 1503 admissions, 894 (59.5%) experienced at least one MRP, with 610 (40.6%) experiencing the outcome event, namely at least one moderate or severe preventable MRP. Participant flow diagram. MRP, medication-related problems. Key characteristics of the 1503 study admissions are summarised in table 1. Data entry checks were performed for 152 admissions (99 from Hospital A and 53 from Hospital B), giving a total of 2432 data item checks; 2429 (99.9%) were correctly recorded, with remedial action taken to refine data entry where necessary. The overall percentage agreement (proportion of MRPs identified) by 59 pharmacists from the study sites was 84.5%, with a Randolph’s kappa coefficient of 0.50 suggesting ‘moderate agreement’.54 55 Further details are given in online supplementary appendix S2. A review of the distributions of the preselected categorical predictors identified five categories each representing fewer than 5% of the study population: theophylline and aminophylline, immunosuppressants, cytotoxics, lithium and ‘other high-risk medicines’ (table 1). As all were categories of high-risk medicines, these categories were combined to create a larger ‘other high-risk medicines’ category. Clozapine was also moved from ‘other high-risk medicines’ to ‘antipsychotics’ on the basis that it is more closely related in terms of pharmacological use. Truncation was required to reduce the influence of outliers for seven variables, and analysis of missing predictor data supported use of multiple imputation (see online supplementary appendix S2). Thirteen predictors were retained in the model following backward elimination: socioeconomic status, number of comorbidities, number of medicines, estimated glomerular filtration rate, white cell count, previous allergy, systemic aminoglycosides and glycopeptides, other systemic antimicrobials, epilepsy medicines, antidepressants and three primary diagnoses (nervous system/mental disorders, respiratory and gastrointestinal). After considering the sensibility of using these predictors, we excluded socioeconomic status due to: (1) its relative complexity, with potential to reduce ease of use of the MOAT in clinical practice; (2) recognition that inclusion may reduce the generalisability of the MOAT by restricting use to English hospitals; (3) the minimal impact of removal on the model’s c-index (0.3% reduction). Once socioeconomic status was excluded from the model, ‘antidepressants’ became non-significant and was therefore also excluded, leaving 11 predictors in the final model (table 2). The c-index for the unadjusted model was 0.681, 95% CI 0.654 to 0.708, with good calibration (see online supplementary figure S3; calibration slope 0.974, intercept 0.012). Following bootstrapping, the c-index was 0.657; optimism for the calibration slope (0.855) was used as a linear shrinkage factor to adjust the regression coefficients of the regression model56 (table 2). The resulting regression equation can be used to calculate predicted risk for an individual patient (online supplementary appendix S4). The sensitivity of the MOAT at the decision threshold separating low-risk and medium-risk patients was 89.9% (95% CI 87.6% to 92.4%), specificity 30.2% (95% CI 27.2% to 33.2%) and positive predictive value (PPV) 46.8% (95% CI 45.5% to 48.1%). At the threshold between medium-risk and high-risk patients, the MOAT’s sensitivity was 66.2% (95% CI 62.4% to 70.0%), specificity 61.0% (95% CI 57.8% to 64.2%) and PPV 53.7% (95% CI 51.2% to 56.2%). These decision thresholds represent the minimum predicted risk probabilities that justify pharmacists’ input. As described in online supplementary appendix S1, the low/medium threshold was selected to identify 90% of patients likely to experience the study outcome; the medium/high threshold was informed by workload pressures, identifying the patients pharmacists should prioritise if they only have capacity to see 50%; it therefore provides a pragmatic indication of the potential clinical usefulness of the MOAT during periods of limited staffing. The decision curve for the MOAT is shown in figure 2 and more detailed results in online supplementary appendix S2. In summary, between threshold probabilities of approximately 15% and 70%, the MOAT is better than both the ‘treat none’ and ‘treat all’ strategies, suggesting it is of value for threshold probabilities within this range.48 As both the low/medium and medium/high risk thresholds fall within this range (25% and 35% predicted risk probability, respectively), the MOAT can be considered to be clinically useful. Should a higher decision threshold be selected (due to extreme work pressures), the MOAT would continue to be of value in terms of clinical decision-making up to a threshold probability of approximately 70%, suggesting significant flexibility. Decision curve for the Medicines Optimisation Assessment Tool. 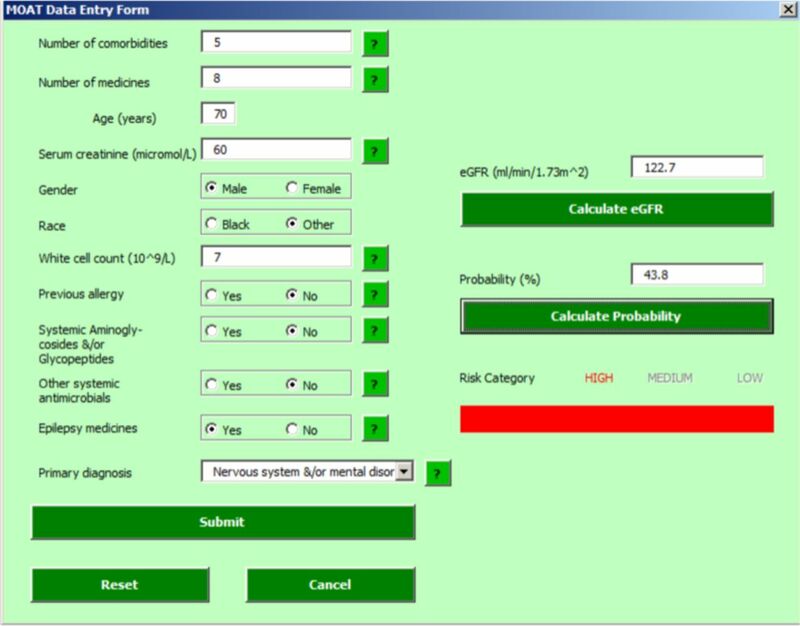 The resulting MOAT was developed as a Microsoft Excel sheet (figure 3), which calculates the estimated glomerular filtration rate, predicted probability of experiencing a moderate or severe preventable MRP and the patient’s risk category. Screenshot of Medicines Optimisation Assessment Tool data entry sheet. The MOAT was perceived as clinically credible and usable by practising pharmacy professionals (online supplementary appendix S2). Additionally, the workload implications, based on the time taken to apply the MOAT compared with potential time saved by deprioritising low-risk patients, were considered to be reasonable. The results also suggest that ‘false negative’ patients may experience fewer outcome events that are of lower severity, compared with patients categorised as medium or high-risk. Over 40% of admissions experienced an outcome event, namely at least one moderate or severe preventable MRP. The predictive performance of the MOAT was fair (c-index 0.66), with a sensitivity of 90% for the low/medium risk threshold (specificity 30%, PPV 47%) and 66% for the medium/high risk threshold (specificity 61%, PPV 54%). Decision curve analysis suggests that the MOAT has the potential to be clinically useful in guiding decision-making at these clinically relevant decision thresholds. Other statistical models to predict adverse medication-related outcomes in hospitalised patients have been developed,16–22 but it is not possible to make direct comparisons with the MOAT due to differences in the type of outcome predicted and/or their proposed target age group, with four models predicting risk in adults over 65 years only.17 18 20 21 Of these existing models, five are reported to have satisfactory predictive performance (c-index of 0.70–0.78),16–18 21 22 but all have methodological shortcomings and limitations that may limit their potential reliability and/or applicability, particularly those developed prior to publication of the Prognosis Research Strategy (PROGRESS) Partnership and TRIPOD recommendations.28–30 Methodological shortcomings include: (1) use of inadequate EPV, with only two of the five studies using an EPV of 10 or more;16 17 (2) poor reporting on quantity and handling of missing data (all studies); (3) use of univariable analysis to select predictors for inclusion in modelling (all studies); (4) categorisation of predictors during modelling16–18 21 and (5) no adjustment for overoptimistic predictions.16–18 21 Regarding potential limitations in use, risk groups were not created for three of the models16 21 22; one requires complex categorisation such as calculation of the Charlson index;16 and all use unclear predictor definitions. To our knowledge, the present study is also the first to use decision curve analysis to assess clinical usefulness. In summary, we believe that none of the existing prediction tools have evidence for sufficient predictive accuracy and/or generalisability to recommend them for routine use outside of the site where they were developed. Although the MOAT’s c-index is slightly lower than some of the other prediction models reviewed, it has advantages in terms of robust methodology, which increases its potential reliability, usability and generalisability. While it is not possible to advocate routine use of the MOAT prior to completion of external validation,29 the MOAT has potential to be applicable to adult hospitalised medical patients (general, acute and elderly medicine), irrespective of age. Given the diverse characteristics of the sample population (table 1), the MOAT also has potential applicability to a wide range of patients in terms of age, ethnicity, comorbidities and medical conditions. The MOAT was also perceived as clinically credible and usable by practising pharmacy professionals. We were able to further investigate the potential clinical usefulness of the MOAT using decision curve analysis. Decision curves inform the range of threshold probabilities where prediction models would be of value in clinical practice, measured as the net benefit (a theoretical relationship between threshold probabilities and the relative value of false positive and negative results).48 As with classification measures, decision curves therefore permit assessment of performance at clinically relevant thresholds. 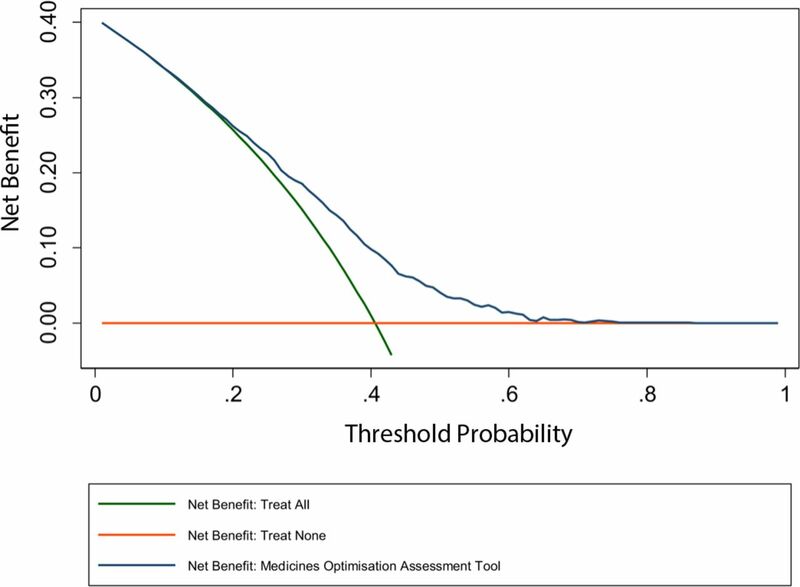 The MOAT’s decision curve suggests net benefit across a significant range of threshold probabilities (15%–70%); decision thresholds within this range therefore have potential to be useful in clinical practice in guiding decision-making. As above, our aim was for 90% sensitivity, which was achieved with a decision threshold of 25% predicted risk probability (the low/medium risk threshold). This threshold, plus the medium/high risk threshold, used to indicate clinical usefulness during limited staffing (35% predicted risk probability), both fall within the range shown to have ‘net benefit’; the MOAT can therefore be considered to be clinically useful at thresholds that are relevant in practice. Furthermore, the creation of risk groups permits pharmacists to take account of workload capacity when prioritising patients, as does the reporting of both the predicted risk probability and risk group for individual patients. The MOAT may require development of implementation strategies regarding the level of pharmacy input required by patients dependent on their risk categorisation. This might range from either no intervention for low-risk patients or one short face-to-face discussion following admission, to more intensive interventions for patients in higher risk categories (such as medicines reconciliation and medication review). It may also be possible to combine the MOAT with other triggers for pharmacy review, for example, swallowing difficulties, end of life care or risk of MRPs postdischarge; potentially the MOAT could then be used as part of a suite of tools, permitting prioritisation of patients and appropriate allocation of workload among team members based on skills and expertise. The development of these types of implementation strategies may also address patients’ views of safety; the medical view of patient safety often focusses on outcomes and avoidance of harm,65 whereas patients tend to focus on what makes them ‘feel safe’, including processes of care, and interpersonal dynamics with care providers.66 67 The MOAT inherently fits a medical view of safety, with attention on ‘risk reduction’; incorporation of the MOAT into a holistic system offering tailored input to patients may therefore help provide a sense of safety for all patients. To the best of our knowledge, the MOAT is the first evidence-based clinical prioritisation tool to identify inpatients most in need of pharmacists’ input (in terms of their risk of moderate or severe preventable MRPs). Further research may also be warranted into the use of risk categories. Organisations may differ in workforce capacity and/or aversion to risk, resulting in a need to develop flexible thresholds, tailored either to organisational need or fluctuating staffing levels. Another potential future development for the MOAT includes integration into automated systems such as electronic health records systems. This could result in the ability to perform accurate, automated risk assessments in ‘real-time’, which would further support implementation into clinical environments. It may also be possible to assess the transportability of the MOAT to determine its ability to produce accurate predictions among people drawn from different but plausibly related populations,74 such as surgical patients, or patients in care homes. We have developed and internally validated a prognostic model to permit targeting of hospital patients most in need of pharmacists’ input based on their risk of moderate or severe preventable MRPs. Extensive external validation, involving prospective validation in a new cohort, will be required to further assess accuracy and generalisability before routine use can be recommended. Further research will also be required in terms of impact and implementation studies to assess the extent to which use of the MOAT may affect decision-making, improve efficiency or improve health outcomes. We would like to thank the patient and public members of the project steering group (Helen Clothier, Marie-France Capon, Derek Smith, Jack Wright and Tom Drabble), also Mary Evans and Lindsay Smith, who provided clinical expertise to this group. We also thank the Pharmacy staff at the study sites, who collected outcome data and took part in the assessment of the Medicines Optimisation Assessment Tool’s (MOAT’s) clinical credibility. Thanks must also go to the expert panel members: Sue Lee, Sivanangai Puthrasingam and Ann Williams, and to Jack Glendenning and Colin Merrill, who supported predictor data collection. Finally, we would like to thank Aneesh Khurana, who provided technical support for development of the electronic MOAT scoring system. We are also grateful to the associate editor and two anonymous reviewers for their very helpful feedback on earlier versions of this paper.
. Medicines optimisation: the safe and effective use of medicines to enable the best possible outcomes, NICE guidelines NG5, 2015.
. Report of the mid Staffordshire NHS Foundation trust public enquiry: mid Staffordshire NHS Foundation trust public inquiry 2013, 2013.
. A promise to learn – a commitment to act. Improving the safety of patients in England. England: TNAGotSoPi, 2013.
. Keeping patients safe when they transfer between care providers – getting the medicines right, 2012.
. Medicines optimisation: helping patients to make the most of medicines. Good practice guidance for healthcare professionals in England, 2013.
. CG138 patient experience in adult NHS services, 2012.
. WHO global patient safety challenge: medication without harm, 2017.
. Prevalence and economic burden of medication errors in the nhs in England. In: Policy research unit in economic evaluation of health and care interventions. Universities of Sheffield and York, 2018.
. Standards of practice for clinical pharmacy services, 2016.
. Prioritising pharmaceutical care delivery at ward level – Vs.1, 2011.
. All hands on deck: prioritisation criteria 2011, 2018. Available: https://www.hqsc.govt.nz/assets/Medication-Safety/Med-Rec-PR/MR-Workshop-2011/MR-Workshop-All-hands-on-deck-Prioritisation-criteria-Nirasha-Parsotam.pdf [Accessed Sep 2018].
. Transformation of seven day clinical pharmacy services in acute hospitals, 2016.
. Standardise, upskill and scale up: how one acute trust is facing the Carter challenge. The Pharmaceutical Journal 2016;297:205–7.
. Developing and implementing a pharmacy risk screening tool. Hospital Pharmacy Europe 2013;71:58–60.
. The PCNE classification V 7.0 2016. [Available from: http://www.pcne.org/upload/files/152_PCNE_classification_V7-0.pdf accessed September 2018.
. A validated, reliable method of scoring the severity of medication errors. Am J Health Syst Pharm 1999;56:57–62.
. Clinical prediction models : a practical approach to development validation and updating. Springer, 2009.
. The power of outliers (and why researchers should Always check for them). Practical assessment, research & evaluation 2004;9:1–12.
. MFP — multivariable fractional polynomial models: Stata press. Available: https://www.stata.com/manuals13/rmfp.pdf[Accessed Sep 2018].
. Essential medical statistics. John Wiley & Sons, 2010.
. Understanding interobserver agreement: the kappa statistic. Fam Med 2005;37:360–3.
. An introduction to medical statistics. UK: Oxford University Press, 2015.
. Identification of risk (prognostic) factors for medication related problems (MRPs) occurring during hospital admission: a survey of healthcare professionals and patient/public representatives. International Journal of Pharmacy Practice 2017;25:49–50.
. Patient prioritization for pharmaceutical care in hospital: a systematic review of assessment tools. Res Social Adm Pharm 2018. doi:doi:10.1016/j.sapharm.2018.09.009. [Epub ahead of print: 20 Sep 2018].
. The measurement and monitoring of safety: drawing together academic evidence and practical experience to produce a framework for safety measurement and monitoring: the Health Foundation 2013.
. English indices of deprivation 2015, 2015. Contributors CG was the principal investigator and was responsible for the initial concept, study design and analysis plan. BDF and LW refined the design and analysis plan. CG applied for National Institute for Health Research (NIHR) fellowship funding, with the support and guidance of BDF and LW. CG carried out the analysis and drafted the manuscript. The manuscript was then critically reviewed by BDF and LW. All authors approved the final version. Funding This work was supported by a Clinical Doctoral Research Fellowship award from Health Education England (HEE) and the NIHR (CDRF-2014-05-033). This article represents independent research supported by the NIHR Imperial Patient Safety Translational Research Centre and the NIHR Health Protection Research Unit in Healthcare Associated Infections and Antimicrobial Resistance at Imperial College. Disclaimer The views expressed are those of the author(s) and not necessarily those of the NHS, the NIHR or the Department of Health and Care. The funder had no role in study design, data collection and analysis, decision to publish, or preparation of the manuscript.